Former Christian City CEO Bob Crutchfield speaking at his 2015 retirement dinner. Photo/Larry Regier. For 22 years, Bob Crutchfield led the efforts and the mission of Christian City. Crutchfield passed away on Sept. 20, leaving a legacy of compassion and service to others. The legacy we leave is the legacy we live. And for Bob Crutchfield, that legacy began in 1993 when he became president and CEO of Christian City. In 2015, Crutchfield informed Christian City’s Board of Trustees, financial supporters, friends and residents of his ALS diagnosis, announcing that he would be retiring due to his declining health, and announcing that the search was underway for a new CEO to take over leadership of Christian City. Crutchfield was one of only three CEOs to serve at Christian City during the organization’s 52-year history. 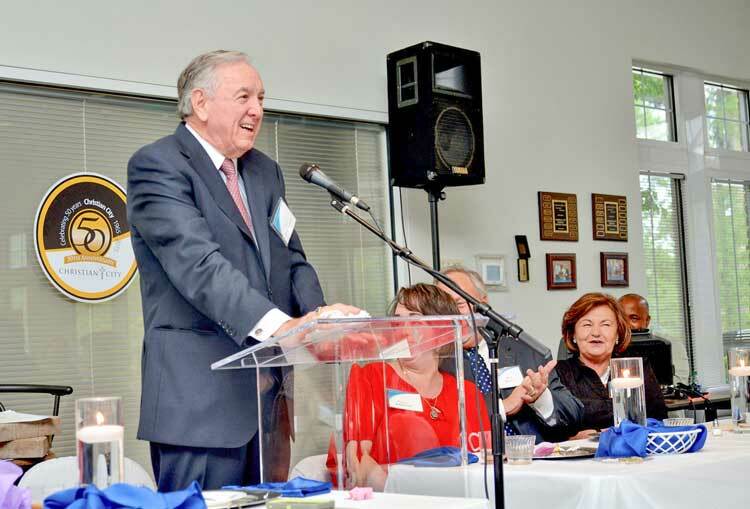 Crutchfield succeeded the non-profit’s first CEO, Bob Puckett. Upon Crutchfield’s retirement in December 2015, Len Romano became President and CEO of Christian City after a 34-year career with YMCA. Through his commitment to understanding that every person has a unique set of circumstances and needs regardless of their creed, Bob lived by the motto of “Above all else, never waiver from the fundamental calling to minister to the needs of our community in the name of Christ.” This unwavering pursuit changed the lives of hundreds of employees, children, residents, volunteers and supporters throughout his career, according to Christian City.